The project aims to bring internet access to the technologically underserved neighborhood around the West Louisville FoodPort site. When Massachusetts-based smart trash can company BigBelly announced plans last year to convert New York City’s rubbish bins into super-fast Wi-Fi hotspots, the international media took notice. Engadget, CityLab, Gizmag, HuffPo, and Popular Science all ran with the story. But while New York’s trash can proposal appears to have been carted off, Louisville has made the concept a reality. 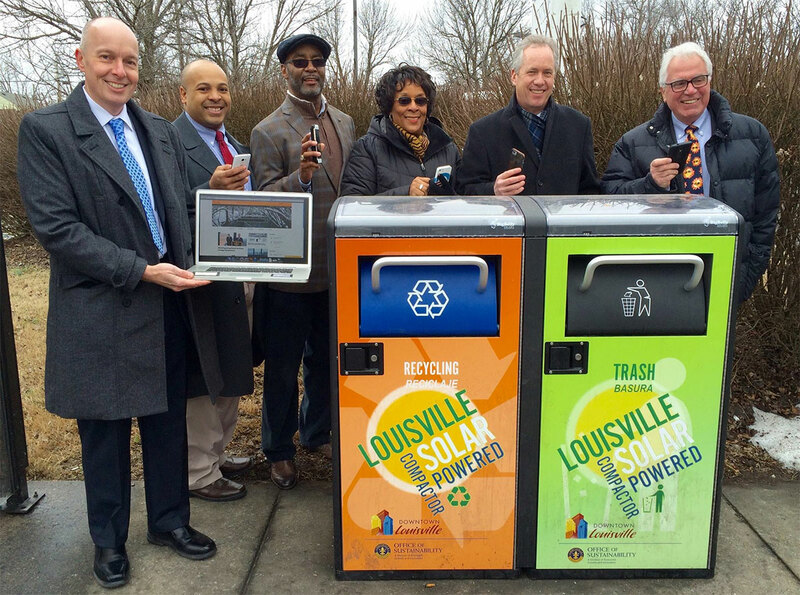 Mayor Greg Fischer says two new trash can Wi-Fi hotspots are a world first, and they’re located in the Russell neighborhood around the planned West Louisville FoodPort. 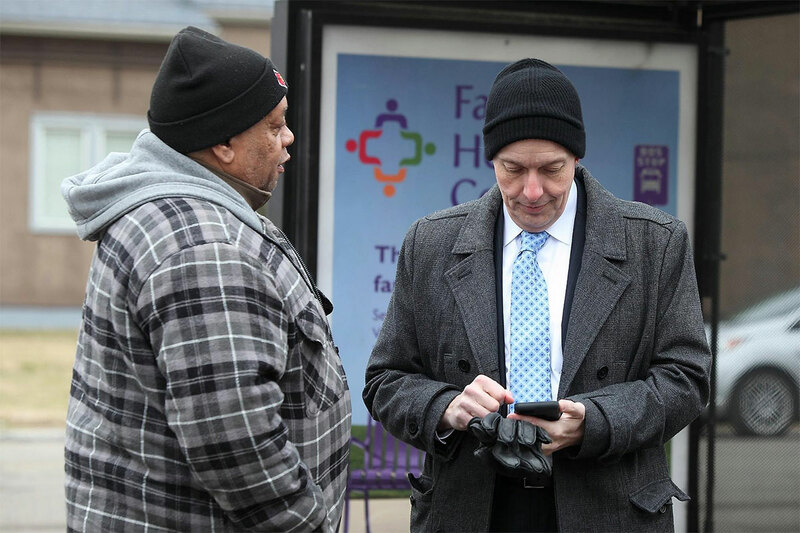 Fischer joined community leaders including Councilwoman Cheri Bryant Hamilton and Chief of Innovation Ted Smith on Wednesday to celebrate the second phase of the so-called West Louisville Neighborhood Wi-Fi Project, which is bringing free internet to the area. Grants supporting Metro Louisville’s Innovation Team funded the two 4G Wi-Fi hotspots along Market Street, which are being leased from BigBelly. 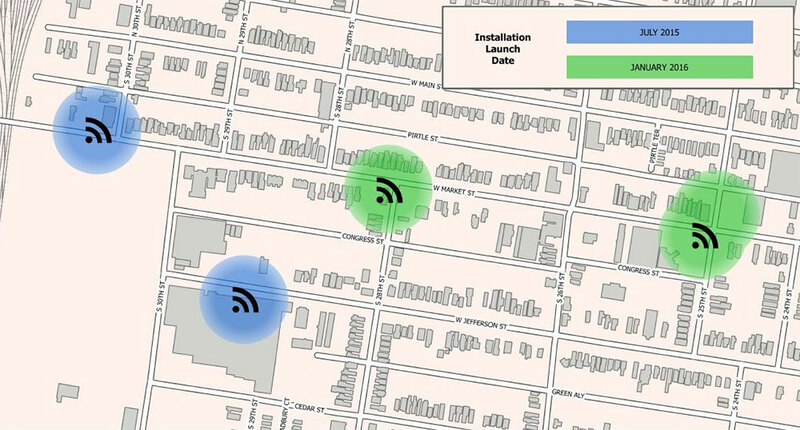 “The neighborhood WiFi project consists of placing access points in strategic locations along key corridors in efforts to create a mesh network for residents and businesses to have access to wireless coverage,” Charles Booker, director of strategic partnerships at Seed Capital Kentucky, the developer of the West Louisville FoodPort, wrote in a post on the company’s website. The first two solar-powered BigBelly trash and recycling units with 4G internet are located at TARC’s Route No. 15 bus stops on Market Street at 25th Street and at 28th Street, making the wait for the bus a little more pleasant. According to a press release, Route No. 15 is among the five top-used transit routes in Louisville with more than 2,200 average weekday trips. Among other things, the city said the Wi-Fi access will help riders check transit schedules and get real-time bus arrival information. But because the BigBelly trash cans are solar powered, their Wi-Fi signal is only available with sunlight, Ted Smith told Broken Sidewalk. “It’s a tricky situation—we’re limited by the sun,” Smith said. “As the days get longer, the hours of operation will get longer.” That means more Wi-Fi in the summer and less in the winter. Each Wi-Fi hotspot broadcasts about 100 feet in all directions, and will operate between 8:00a.m. and 6:00p.m., the city said (with extended hours in summer months). That systemic weakness is also its strength, Smith added. He said that the units—the first outside Downtown—can be easily set up without relying on telephone poles or fiber infrastructure. Instead, these trash cans connect with cell towers, acting as a boosted mobile hotspot seen on many phones. Besides broadcasting a Wi-Fi signal, the solar panel on top of the BigBelly units also compacts the trash or recyclables inside, increasing their capacity by five times over a standard bin of the same size. The units also broadcast a signal to Metro Louisville Public Works when the bins are full, to reduce maintenance costs by up to 70 percent annually. 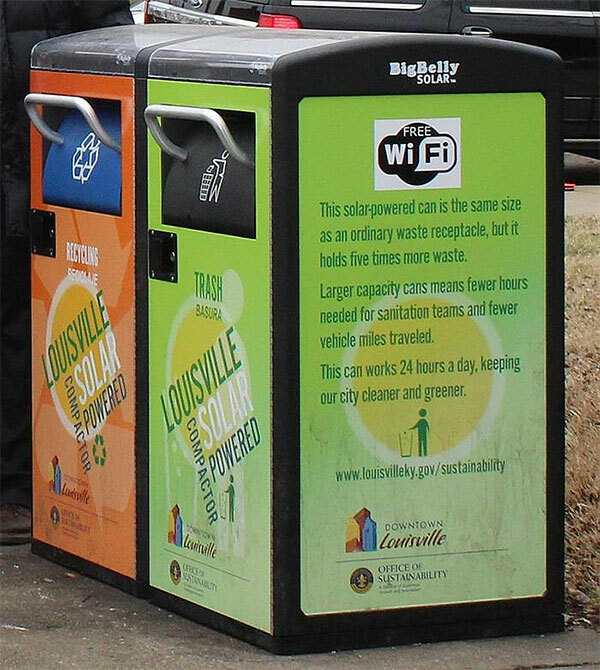 BigBelly solar-powered trash and recycling bins made their debut in Louisville in 2011 with a pilot project of the Louisville Downtown Management District, now part of the Louisville Downtown Partnership. Broken Sidewalk reported last year that the first phase of the project brought Wi-Fi nodes to several Russel locations including 2910 West Jefferson Street, 2927 West Market Street, and 2501 West Market Street. So far, the city says almost 1,000 people have accessed the phase one hotspots, using more than 100GB of free data.